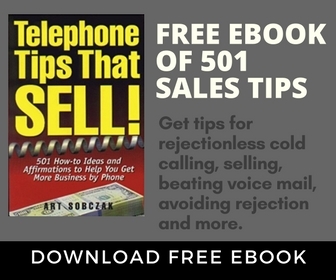 Since 1983, Art Sobczak and Business By Phone Inc. have helped hundreds of thousands of professionals say the right things by phone to get more of what they want. Our reputation has been built on providing common-sense, non-salesy, non-gimmicky conversational methods, processes and word-for-word instruction on how to use the phone to get through, get in, persuade, and sell. In 2012 Art received the Lifetime Achievement Award from the American Association of Inside Sales Professionals for his contribution to the profession. 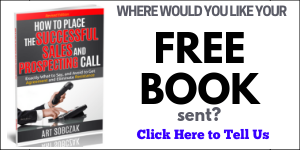 His latest book, “Smart Calling,” hit Number One in amazon.com’s Sales category its very first DAY, was named Top Sales Book of 2010, and will come out in a Revised Second Edition in early 2013. Here are the ways we have helped, and continue to serve sales professionals. Art Sobczak has delivered over 1500 in-person training programs, ranging from multiple day and long-term repeat engagements, to 30-minute keynote presentations. He customizes and delivers onsite programs for companies and associations, and offer online and hybrid online/webinar programs. For over 34years Art has published the monthly subscription Smart Calling Report training letter. This eight-page training newsletter contains brief tips and more in-depth articles and lessons, as well as Art’s monthly rants and observations. 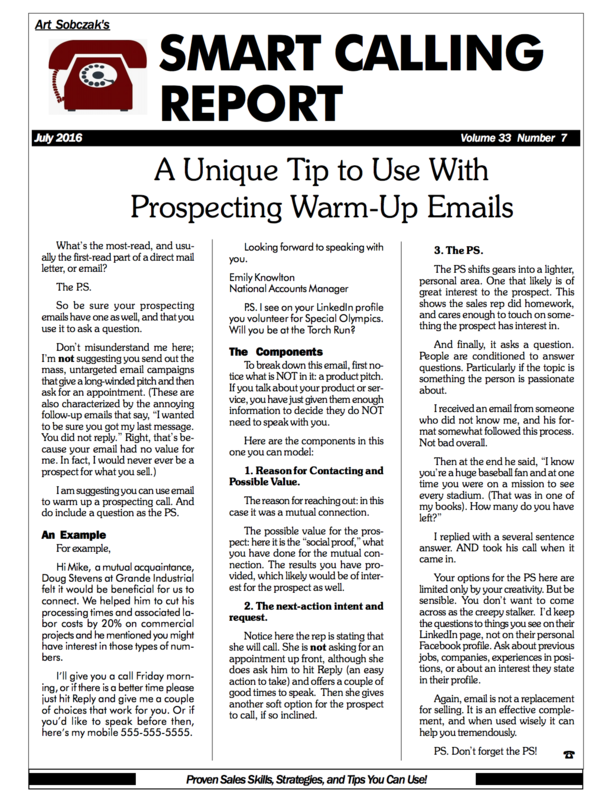 Countless sales pros who received their first early sales training as a result of this publication are now VP’s, Directors, and Presidents. Art Sobczak has created hundreds of training resources over the years… including five books, and many audio and video training programs, and ebooks and special reports. In addition, he has published a number of books on sales and management and motivation by other authors. You can see these resources in our online store. 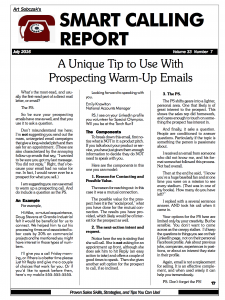 Since 1998 Art has been publishing one of the longest-running email sales tips newsletters, always full of usable, entertaining content, our policy is to provide value first, instead of bombarding list members with “BUY THIS” messages. Visit the Smart Calling Blog for more tips, techniques and other valuable info to help you get more business. And, occasionally Art throws in a rant, a call recording, a video, or something fun not even related to sales. This is a massive online collection of text, video, and audio word-for-word scripts, sales tips, articles, lessons, examples, , answers, case studies, call makeovers and more. Over 2000 pieces of sales-building material all in one searchable place. See details and examples here. 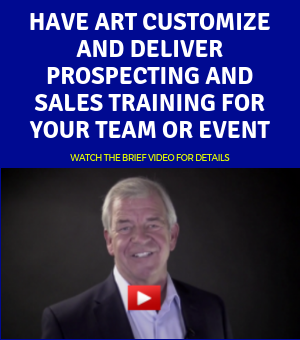 Bottom line, if you do inside sales and/or prospecting using the phone, Art Sobczak and Business By Phone Inc. has something that can help you. Browse the sites, or call us at 800-326-7721. For over 30 years Art has been helping sales pros--and those who need to sell but it's not in their title-- say the right things to get through, get in, and sell, without "rejection."